These products have shapes or prints of home related items, such as dishes, teapots, keys, little houses, clocks, and more. Product Description: Buttons with the shape of small houses. Referencia Dress-It-Up: 0980.To be used in craft, scrapbooking, card making, patchwork and general sewing projects.Content: 8 buttons of the same model in different colors.Diameter: 24 mm.Material: Plastic. Product Description: Decorative buttons and embellishments with the shape of tools (drill, saw, ladder, screwdrivers, nails, paint, brush, hammer and angle ruler). Ref. Dress-It-Up: 414 Content: 10 pieces (6 buttons and 4 embellishments). Diameter: 18 to 38 mm Material: Plastic. 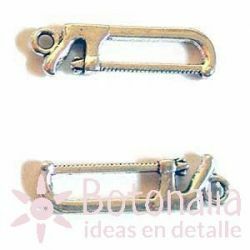 Product Description: Buttons and embellishments with the shape of sewing tools. Content: 18 pieces de 3 different models, in various colors. 6 of them without holes. Diameters from 11 to 15 mm. Material: Plastic. Metal embellishment (charm) with the shape of a hammer (tool). Content: 1 embellishment Diameter: 26 mm. Material: Metal (Zinc alloy). Metal embellishment (charm) with the shape of a saw (tool). Content: 1 embellishment Diameter: 26 mm. Material: Metal (Zinc alloy). Metal embellishment (charm) with the shape of a pair of pliers (tool). Content: 1 embellishment Diameter: 26 mm. Material: Metal (Zinc alloy).